Home » Food and Nutrition » What Do Carbohydrates Do? Carbs. They can be a bountiful source of energy for some and a bad five-letter word to others. In terms of food, carbohydrates work as fuel for our brain and energy for our muscles. There are some types of carbohydrates that work against the body when consumed in large amounts, known as simple or refined carbohydrates such as white flour and processed sugars. While carbohydrates are generally used as a main staple of a balanced nutrition, there are sources claiming we do not need them. Citing the American Journal of Clinical Nutrition, Wikipedia states: “carbohydrates are a common source of energy in living organisms; however, no carbohydrate is an essential nutrient in humans. To gain perspective of both sides of the carb controversy, let’s take a closer look at what a carbohydrate does and its effect on our body. A carbohydrate is appropriately named for its molecular structure of carbon, oxygen and hydrogen. Along with protein and fat, carbohydrates are one of the three main sources of the body’s energy. To maintain good overall health, we must consume these three macronutrients as our bodies do not produce them. Working together, carbohydrates, protein, and fat intake ensure our system works as it should. The role of carbohydrates is two-fold. We use it for fuel for the central nervous system and energy for our muscles as well as to prevent protein from being used as an energy source and allow fast metabolism. There are simple carbohydrates and complex carbohydrates. Simple carbohydrates absorb quickly and more easily such as dairy, candy and some fruits and vegetables. These are labeled as fructose, sucrose, and lactose, for example. This gives you short bursts of energy and spikes in blood sugar. Complex carbohydrates absorb and digest more slowly, allowing you to sustain higher energy levels longer. These are found in starches such as potatoes, corn, beans and whole-grain breads. As the top energy source, carbohydrates attribute to the development of muscles and healing processes of the body. Without carbohydrates, the body uses its protein supply as the main energy source rather than to build and repair tissue. You have heard athletes and fitness buffs remark “need my carbs” before a workout, and there is good reason for that. While fats give larger amounts of energy, they cannot be used to their fullest ability without carbohydrates to boost the metabolism rate by oxidizing the fats. On our road to good health, there are many dos and don’ts, particularly about what foods we should eat. How are we supposed to know whether to include carbs, and if we do, what types? We have compiled a sample list for you of those carbohydrates in food that work with your body, not against it. 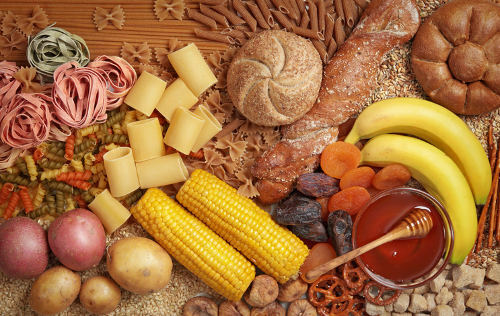 How Carbohydrates Benefit Your Health? The combination of the proper fats and carbohydrates also prevent ketosis, a process in which your body will use fat instead of glucose for an energy source. Mild conditions of ketosis results in temporary rapid weight loss but more serious conditions can be toxic. Carbohydrates also keep you regular as it maintains good function of the lower digestive tract. Foods rich in fiber such as carbohydrate-enriched whole grains aid in preventing indigestion and constipation. Despite some reports, proper carbohydrate consumption actually promotes weight loss and helps maintain weight once a goal has been reached. Remember a healthy amount of carbohydrates burn fat cells, satisfies your hunger with high-fiber food, balances protein levels and maintains good digestion. You can even indulge in simple carbohydrates to pick up your mood. By releasing serotonin, the pleasure hormone, carbohydrates are the main “go-to” treat for many people. This is where too much carbohydrates comes in as the refined and processed sugar products of sweets, and some alcohol, can make the brain crave more. Time for moderation is now. By consuming various complex carbohydrates first thing in the morning, you can still have that sweet taste of simple carbohydrates. Our saliva has the natural ability to turn starch into sugar, which allows us to enjoy a natural pleasant taste with breads for breakfast.